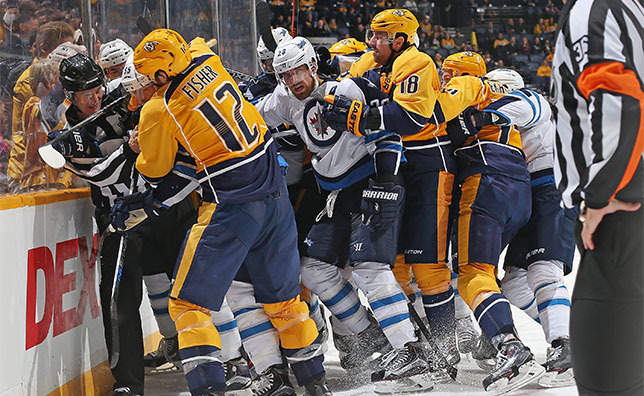 The Nashville Predators scored four times in the first period and never looked back as they knocked off the Winnipeg Jets by a 7-0 final on Saturday night at Bridgestone Arena. It was the second time this week the Preds have put up seven goals in a game, the first coming on Tuesday in a 7-5 win over Ottawa. Six different skaters tallied for the Preds while Pekka Rinne stopped all 20 Jets shots he faced. 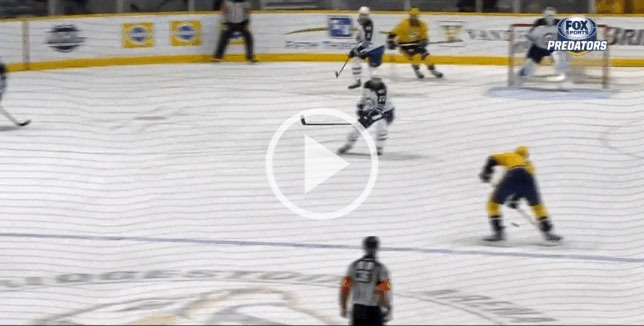 The Preds struck first when Cody Hodgson chipped a pass ahead to Calle Jarnkrok who one-timed the puck from the right circle past the glove of Michael Hutchinson for his third goal of the season. Craig Smith chimed in just over a minute later by finishing off a pretty passing play involving Seth Jones and Filip Forsberg, who found Smith with plenty of time on the doorstep to deposit the puck for a 2-0 advantage. Seth Jones then got on the board of the first time on the campaign and chased Hutchinson in the process for a 3-0 lead. Jones’ point shot found its way through traffic, leading Jets Head Coach Paul Maurice to send Ondrej Pavelec in to tend net. The second Winnipeg netminder was welcomed by a goal from Mike Ribeiro, who potted his second of the season at the 14:33 mark for a 4-0 Nashville advantage to finish out the opening period. The newly-formed line of Smith, Ribeiro and Filip Forsberg was on the ice for three of the four first-period goals. It was the most goals the Preds have scored in a single frame since they registered five in the third period at Toronto on Nov. 18, 2014. James Neal started the second period off when he made it 5-0 at the 2:56 mark on a feed from Colin Wilson. It was Neal’s team-leading eighth of the season and his 14th all-time against the Jets, his most against any team. Jarnkrok added his second of the night on the power play in the third period before Mattias Ekholm scored on the man advantage to round out the scoring. The two teams also combined for 156 penalty minutes in a chippy affair, 72 of which were handed to Nashville, their third-highest, single-game total in club history. But the Preds kept their focus despite the commotion, finishing off one of their strongest efforts of the season, which started right from the opening faceoff. Looking for a spark after the Predators only scored once on Thursday in a shootout loss to Toronto, Laviolette tweaked his top two lines Saturday night, putting Filip Forsberg alongside Mike Ribeiro and Craig Smith on one unit, while Colin Wilson skated with Mike Fisher and James Neal. It worked pretty well. The Forsberg-Ribeiro-Smith line was on the ice for three of the four first-period goals, with Smith scoring his first since Oct. 17 at Ottawa. Ribeiro’s goal was his second of the season, his first since Oct. 22, and the veteran forward was pleased with the tweak in the trios up front. Seth Jones’ point shot zips past a few players and goaltender Michael Hutchinson on its way into the net for a 3-0 Preds lead. The Predators have scored 15 goals over their last three games. Nashville is now 4-0-0 when Craig Smith scores a goal this season. 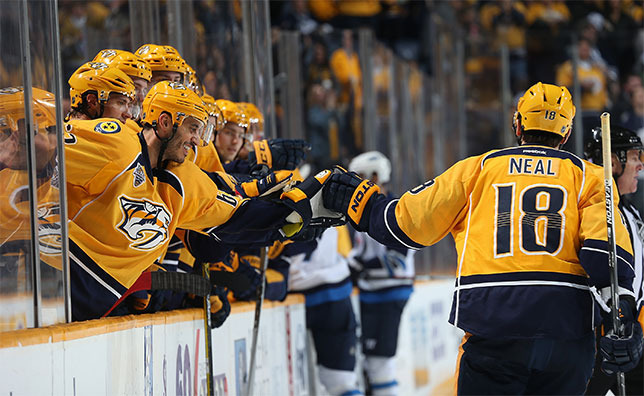 Filip Forsberg (3a) and James Neal (1g-3a) are both on three-game point streaks. Nashville is now 9-1-1 this season when scoring the first goal. The Predators face the Anaheim Ducks on Tuesday night at Bridgestone Arena, the third and final meeting between the two clubs this season. 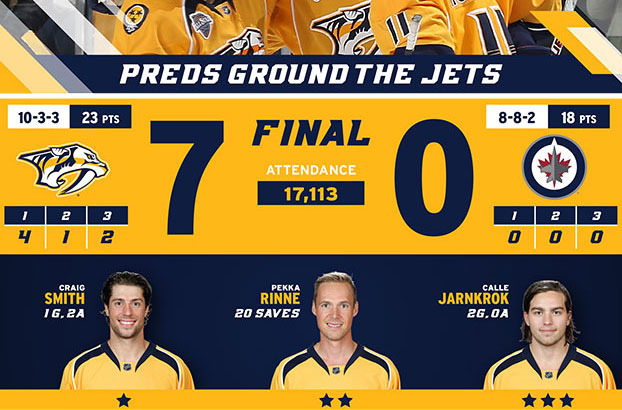 Pekka Rinne and his 20-save shutout find a place of prominence in tonight’s infographic.